We only want to peacefully enjoy our leisure time, but we have to leave our favorite spots to these nasty little creatures. 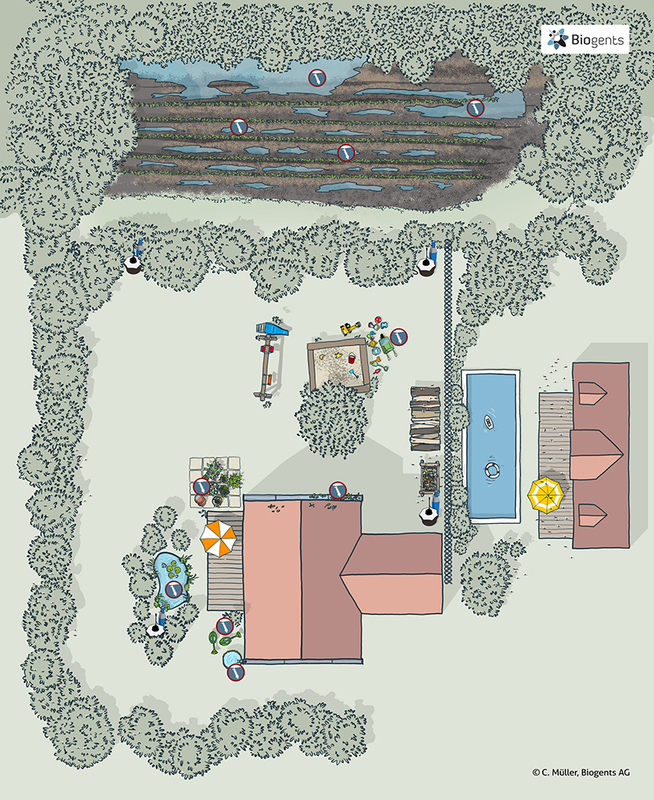 Maybe you have the same problem and want to know what you can do in order to enjoy your backyard again? 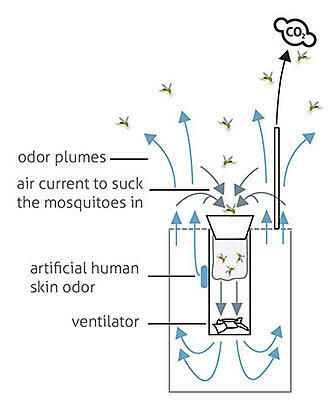 After many years of intensive research, Biogents developed an outdoor mosquito trap: The BG-Mosquitaire CO2. Here’s how the trap works: Inside the trap, there is the BG-Sweetscent dispenser – an artificial human skin scent. A fan produces an air current that leaves the trap together with the human skin scent through the white upper surface are of the trap. In this way, the convection currents of a warm human body are imitated, and to the mosquito the trap looks just like a human body. In the center of the upper surface of the trap there is a black funnel through which lured mosquitoes get sucked into the trap where they dehydrate in a catch bag. The color contrast between the black suction funnel and the white upper trap surface is an additional visual attractant for mosquitoes. The CO2 boosts the effect of the artificial skin scent and multiplies the catch rates. CO2 is present in human breath, and when it is added to the trap in the right concentration, it attracts mosquitoes like a charm! What’s the difference between the BG-Mosquitaire and the BG-Mosquitaire CO2 trap? That’s simple: When you operate the trap without CO2, it’s a BG-Mosquitaire, and when you operate it with CO2, it’s a BG-Mosquitaire CO2. The BG-Mosquitaire is already a very efficient trap for tiger mosquitoes. A scientific study showed that even without CO2 the BG-Mosquitaire outperforms other mosquito traps that need to be operated with CO2. The same study also demonstrated that by adding CO2 to the BG-Mosquitaire the catch rates of Asian tiger and house mosquitoes are increased five-fold! Moreover, with CO2 the trap catches a higher diversity of mosquito species. So: With CO2, the trap is much more powerful, but even if you run out of CO2 or forget to turn it on, you’ll still have an efficient tiger mosquito trap. Where should I place my mosquito trap? In shady, wind-protected places, with high humidity such as under bushes or low-hanging vegetation where mosquitoes hide to rest. 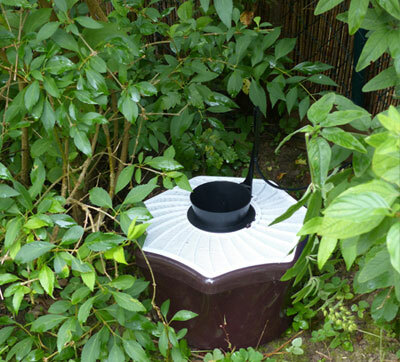 The trap is suitable for all gardens, leisure facilities, sports facilities, outdoor restaurants, campsites, and hotels. The BG-Mosquitaire CO2 may only be used outdoors – this is the case for all traps that use CO2. The mosquitoes (or at least most of them) are getting trapped close to their breeding and resting sites in the garden, before they come close to your home to bother you! Correct positioning is crucial! Since mosquitoes avoid direct sun and seek humid and shady places, you have to position your trap in such locations. When visiting our customers, we sometimes find misplaced traps, for example in direct sun in the center of the garden. As mosquitoes hardly spend any time there, they will not be effectively trapped in such place! Some customers position their trap right under the terrace table, because there their legs get frequently bitten. This doesn’t work either. Well, for mosquitoes it’s an amazing place to be – shady, protected, and full of food. While the trap mimics a human, a real human is still much more attractive to the mosquito than the trap. We need to trap the mosquitoes before they reach us – so place your trap away from where you sit and in the shaded areas with vegetation and high humidity! Take a look at this webpage with many information about the correct positioning of Biogents traps! When should the trap be put out? In temperate climate zones in the Northern Hemisphere, a rule of thumb is from April on or when daytime temperatures exceed 60° F. One thing is sure: The earlier you start to catch mosquitoes the better! Keep in mind that every female mosquito can lay hundreds of eggs! The trap should run 24 h per day, but the CO2 only needs to be added during mosquitoes’ “rush hours”. This can be done easily using the BG-CO2 Timer: a clock timer which allows you to program certain time windows, during which you want the CO2 to be added. In this way, you can save a lot of CO2 and therefore money! Using the timer is much more convenient than turning the CO2 on and off by hand. Take care to always follow these rules. If after using your trap for a few days you have the impression that it catches too few mosquitoes, move it to another position! Ten feet may make a big difference – try it out!